Performing Middle Eastern and Asian music, using the authentic traditional instrument tunings. Peforming medieval, baroque, and classical Western music, using the authentic tunings for which it was written. Examples include just intonation, well temperament, Pythagorean tuning, meantone temperament, etc. Teaching unconventional tonal systems, such as the above. Creative experimentation and improvisation with alternative tunings. The DMTB translates a MIDI stream, such as might be produced by a keyboard, a sequencer, or any combination of instruments, so as to shift individual notes up or down by an adjustable number of small increments. The control panel allows one to specify how each of the twelve conventional notes in an octave of the chromatic scale should be shifted, and applies the shifts all the way up and down the scale. 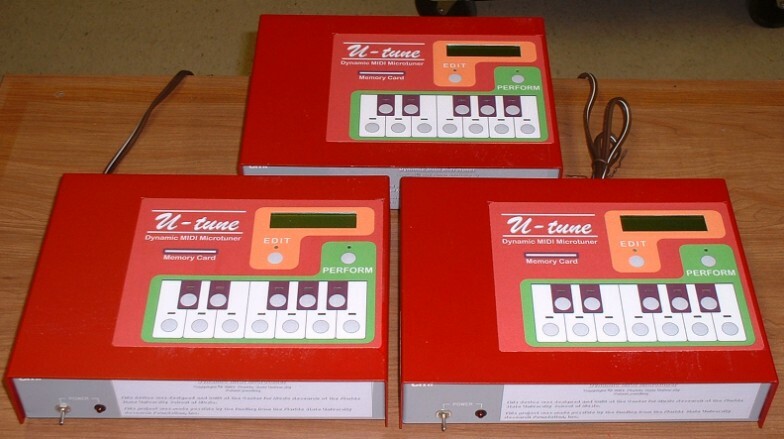 Several tunings can be programmed, and one can quickly and easily change between them, without touching the individual instruments or the synthesizer. 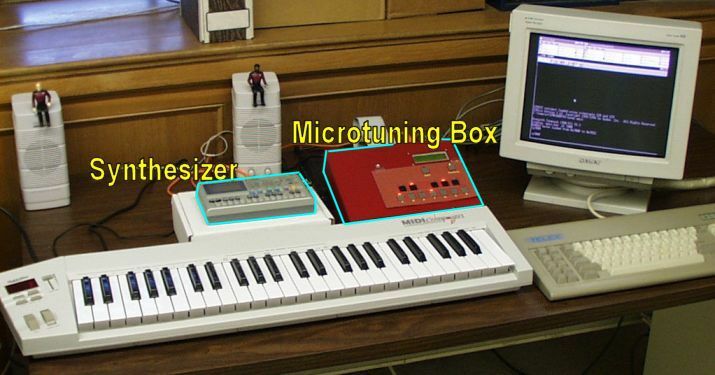 A photo of a demonstration setup, using one of the DMTB prototype boxes, a synthesizer, and a keyboard, is shown below. DMTB is an implementation of an idea of Ahmed Moussa, designed and executed by Eitaro Kawaguchi. Ahmed is a Ph.D. student in the FSU Department of Computer Science. The DMTB is the subject of Ahmed's Master's thesis, which he did under the direction of Professor Ted Baker. Eitaro is a member of the staff of the FSU Center for Music Research. DMTB is able to adjust the pitch of individual notes. This allows it to be applied to music with simultaneous notes (including chords) on a single channel. This is in improvement over earlier MIDI dynamic tuning techniques such as those that use pitch bending, since pitch bending modifies all the notes uniformly within a given channel.